I was inspired by Sasha's Angel Hair Pasta with Grape Tomatoes, Garlic and Pine Nuts so I decided to also add a light, spring meal with pasta, tomatoes, pine nuts and a few other relatively healthy ingredients, feta cheese, mushrooms, broccoli rabe & turkey sausage. I'd say this would probably serve 4 or so and pretty much covers all your food groups. I had never cooked broccoli rabe before but usually like it quite a bit. I looked up a few recipes online and they all suggested boiling it first and then sauteing it. I boiled it for a couple of minutes and then most of the recipes said to place them in ice water to freeze the cooking time. I just ran cold water over them and then cooked them in the pan and mine were a little overcooked so maybe the ice bath would have been worth it. When I cooked them in the pan I have the garlic, mushrooms and olive oil in there to cook those as well. I cooked the turkey sausage on my grill pan and then sliced them into thin discs, maybe an 1/8 of an inch each. 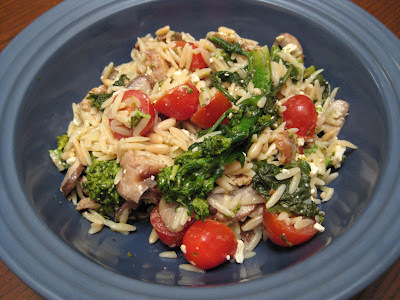 After the sausage and broccoli rabe were cooked I just mixed everything together in the pot I boiled the broccoli rabe. I added the pine nuts, feta, tomatoes and a little more olive oil and the balsamic vinegar to taste. Everything worked very nicely together but I just wish I hadn't overdone the broccoli rabe. I will have to try and cook it again sometime. Yum, Sasha, this looks wonderful. I love Orzo pasta. It has the best feeling on the palate! This dish is pretty too. By the way, the dessert Challah is a good idea. Sounds like it might be tea time for you guys!